Food is NOT the enemy especially when you can make delicious low fat favorites! You get my drift. You can fill in the blanks with your own favorite foods. 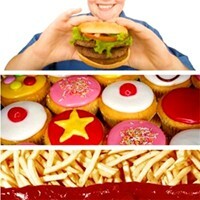 This article is about food cravings, and Id like to start off by saying we often crave what we fear we cant have. HAVE YOU BEEN RULED BY FEAR? Thats the psychological craving we experience. Heres the good news; with a little creativity, you can healthfully enjoy most of the types of foods youve always loved. Want chocolate? OK. We can have healthy, low fat chocolate desserts. How about french fries? Not a problem. Ill show you how to make scrump-dil-eee-is-cious, low fat oven baked french fries! What about wedding cake? A wedding cake has to be really special, right? Well, I havent had the need to make one yet, but I know others who have and theyve been fabu! What about one of my all-time favorite foods gooey, sticky, finger-licken good, BBQ? Can we have that? Yes, of course! Thats an easy one! In fact, Ill share some taste treats so delish that youll want to have your friends over just to have a BBQ and I promise you no one will guess theyre low fat and healthy! Donuts? Yep! Ive got some GREAT oven baked donut recipes that will knock your socks off. Your life will never be the same! Hamburgers? Yes yes yes! Well, of course, theyll probably be turkey burgers or veggie burgers, but youre gonna love them! They have all the trimmings and fixings to become your new favorites! You see, my friends, there are many foods that we psychologically crave and the good news is, if you stick around this blog long enough, youll find oodles and oodles of delicious recipes that will fulfill each and every one of your mouth desires. But theres a completely other kind of craving I want to address in this post and thats the physiological craving. The truth is, as an obese person, I was completely unaware that SOME or MANY of my cravings were probably being caused because of the lack of balanced nutrition in my body. When the body lacks certain vital elements, it craves quick fixes in an attempt to bring it into balance. Of course, the quick fixes dont work for long and so the cravings go on and on. I THOUGHT I WAS OUT OF CONTROL! The fact is, I was out of balance. See how hard we can be on ourselves. The reason behind food cravings can be as simple as not eating the right balance of protein, fats and carbohydrates which your body needs in order to function optimally. Cravings can also be a sign of vitamin or mineral deficiency. Here is a list of a few common cravings and what nutrients the body may need. 2 Comments on "WINNING THE LOSING GAME: Say Goodbye to Food Cravings"
Interesting post. I like the chart of cravings and healthy substitutes. I agree that when we have a craving for something, we can always find a healthy alternative instead. I wanted pizza, so I made sprouted grain english muffin pizzas with veggie cheese and a healthy tomato sauce. They were really good! I have found that the more I eat like this, the less I crave any real junk food. Im thankful for that! .-= Eating Raw Foods Infos last blog ..Raw Foods – Are You in This Alone? =-. Ill be checking out your blog. Ive been interested in raw foods, not as a complete way of life, but as healthy alternatives. I even went to the Living Light Institute in California for lunch and it was AMAZING! Bought the cookbook, but have been afraid to really delve into it.